In 1937 Li Ling-Ai, a Chi­nese Amer­i­can play­wright from Hawaii, knew noth­ing about mak­ing movies. Rey Scott, an adven­tur­ous pho­to­jour­nal­ist from the Mid­west, had nev­er held a motion pic­ture cam­era in his hands. They had no finan­cial back­ing from Hol­ly­wood or the gov­ern­ment. 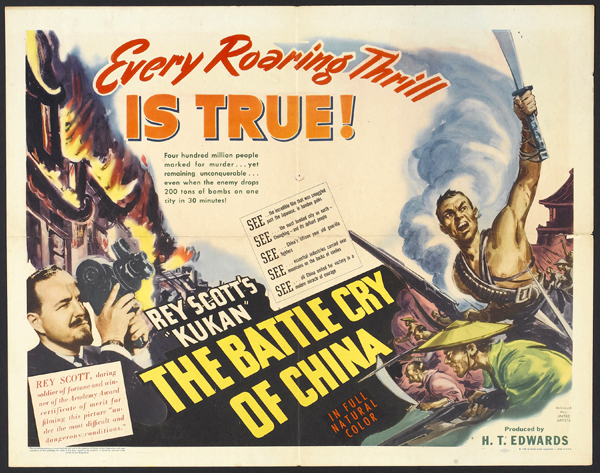 Yet togeth­er they cre­at­ed KUKAN, an epic col­or film of Chi­na at war that would become the first Amer­i­can fea­ture length doc­u­men­tary to win an Acad­e­my Award. KUKAN’s impact went far beyond the world of film. When the it pre­miered in NYC on June 23, 1941 the U.S. was still main­tain­ing a pol­i­cy of neu­tral­i­ty in mil­i­tary con­flicts abroad. But the film clear­ly depict­ed the bru­tal­i­ty of the Japan­ese mil­i­tary machine against the cit­i­zens of Chi­na, and it became a ral­ly­ing point for those who want­ed to sway pub­lic opin­ion towards U.S. engage­ment in the Chi­nese war. The film was screened at the White House for Pres­i­dent Roo­sevelt, was wide­ly cov­ered in news­pa­pers across the coun­try and the sub­ject of edi­to­ri­als in papers like the New York Times and Chica­go Dai­ly Times. Hen­ry Luce of Time mag­a­zine held a pri­vate screen­ing of the movie for all of his employ­ees, and it was used as a fund-rais­ing tool for var­i­ous Chi­na relief orga­ni­za­tions. The film went on to play in U.S. the­aters well into World War II. How­ev­er, after war’s end and the Com­mu­nist takeover of Chi­na, the film fad­ed from view along with the sto­ry of its cre­ators. In fact, until recent­ly, KUKAN was offi­cial­ly cat­e­go­rized as a “lost” film by the Acad­e­my of Motion Pic­ture Arts and Sci­ences. No copy was known to exist. At the end of 2009, after a year of pre­lim­i­nary research into the life of Li Ling-Ai, pro­duc­er Robin Lung dis­cov­ered a copy of KUKAN and has been on a mis­sion ever since to find out more about the film and its cre­ators. Learn more about Li Ling-Ai HERE.